catch your favorite team’s game. 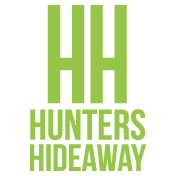 Hunters Hideaway is a locally owned neighborhood bar and grill that takes pride in the service and experience of our guest. We have a 5-page menu that includes Steaks, Wings, Salads, Burgers, Pizza, and much more. We also have 23 TVs if you are looking to catch your favorite team’s game. 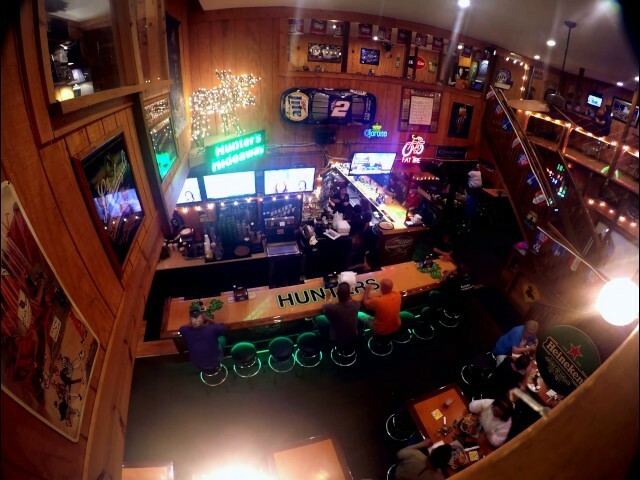 If you are looking for a family-friendly night out, with great food and service – Hunters is the place! Coming in late July and currently in construction, soon you’ll be able to enjoy all your Hunter’s favorites on our new patio. Jumbo shrimp tossed in our freshly homemade cocktail sauce. 10 oz portion of chicken gizzards lightly breaded and deep fried. Hand breaded whole mushrooms deep fried & topped with melted cheese. Served with ranch dressing. Lightly battered dill pickle chips served with ranch dressing. 4 pretzel sticks served with cheese and mustard. 6 cheese sticks served with marinara. 6 Jalapeno peppers stuffed with seafood cream cheese and hand breaded served with Ranch dressing. A tower of onion rings served with ranch dressing. French fries, shredded beef, gravy, cheese curds. Tortilla chips covered in pulled pork, cheddar cheese sauce, lettuce, red onions with a drizzle of Hunters & Boom Boom sauce. Tortilla chips covered in ground beef, refried beans, cheese sauce, shredded cheese, tomato, onion, black olives, salsa, & sour cream. Plain and simply stated with cheese. Melted american cheese & 2 slices of bacon. Two burger patties, 2 slices of bacon, and melted american cheese. Covered with one fried egg, bacon, and melted American cheese. Topped with grilled mushrooms and melted swiss cheese. Topped with bacon, melted swiss cheese, grilled onions and BBQ sauce. Topped with melted swiss cheese, and grilled green olives. Topped with melted cheese, lettuce, tomato, and a special sauce served on sourdough bread. 100% plant based patty served w/ lettuce, tomato, onion, pickle. All of the Chef ’s presentations come with your choice of potato and a breadstick. All of our steaks are charbroiled with our own seasonings. A 10 ounce cut of choice sirloin steak, grilled to order. A 12 ounce cut of choice rib-eye steak, grilled to order. Two 6 oz boneless pork chops topped with bacon jam. Tender filet basted with garlic butter and seasoning. Shredded lettuce topped with taco meat, shredded cheddar cheese, diced tomato, onions, black olives, salsa, sour cream, and finally deep fried tortilla strips. Mixed greens, grilled chicken strips, mandarin oranges, almonds, and chow mein noodles. Served with our house sweet and sour dressing. Mixed salad greens topped with bourbon grilled steak strips, diced tomato, chopped eggs, croutons, bacon bits, and shredded cheddar cheese. Served with our own house dressing. Mixed salad greens, diced tomato, cucumber, mandarin oranges, chow mein noodles, and topped with a grilled salmon fillet. Served with our own dill ranch dressing. Mixed greens, chicken tenders, shredded cheddar, tomatoes, bacon, eggs & croutons. All Wraps are in a flour tortilla. Served with your choice of side. Ham, turkey, bacon, shredded lettuce, tomato, mayo with shredded cheddar cheese. Crispy chicken rolled in our medium sauce, ranch dressing, shredded lettuce, tomato and shredded cheddar cheese. Grilled chicken, shredded lettuce, caesar dressing, bacon, and parmesan cheese. Grilled chicken, diced tomatoes & cucumbers, black bean corn relish, shredded lettuce, and southwest dressing. All deli sandwiches are served with your choice of side. A large pork tenderloin fresh from the butcher. You can have it either breaded and deep fried or grilled. A triple decker B.L.T. served on white toast, six strips of bacon, lettuce, mayo and tomato. Hoagie bun stuffed with ham, turkey, bacon, lettuce, tomato, and melted mozzarella cheese. Large portion of pulled pork cover with bbq sauce served with coleslaw. Grilled rib-eye steak, mushrooms, onions, our special sauce, served on a hoagie bun. Ham, pulled pork, grain mustard, pickles, swiss cheese served on hoagie bun. Shredded roast beef, green pepper, onion, and mozzarella cheese on a hoagie bun. Served with Au Jus. A large grilled chicken breast, bacon, melted Swiss cheese, lettuce, tomato, and mayo. All pizzas are 12” and only available in thin crust. Gluten-free pizza crust is available for an additional $2. Choose from any toppings below to build your own creation. Pepperoni, sausage, bacon, green pepper, onion, & black olives. Diced tomatoes, green pepper, onion, and mushrooms. BBQ Sauce, pulled pork, onions, boom boom sauce, cheese. Pepperoni, sausage, bacon, ham, chicken, Pulled Pork. Green pepper, tomato, mushroom, onion, black olives, green olives. Plain, Mild, Hot, Hunters Sauce, Bbq, Teryaki, Honey Mustard, Bourbon, Parmesan Garlic, Caribbean Jerk. A 12” flour tortilla, stuffed with taco meat, refried beans topped with enchilada sauce, melted cheddar cheese, salsa and sour cream. Lettuce, tomatoes & black olives served on the side. A 12” flour tortilla stuffed with grilled chicken, melted cheese and our own secret sauce. Served with lettuce, tomatoes, and black olives on the side. A fried beef patty and mashed potatoes covered in country gravy and served with a breadstick. 1/2 lb of beer battered cod served with fries and coleslaw. Open faced beef sandwich served with mashed potatoes and all covered in brown gravy. Breaded shrimp served in a basket with fries, coleslaw, and a breadstick. 1/2 lb of breaded chicken breast strips w/ choice of side & sauce. All meals include a drink & are served with fries & mandarin oranges. All soups are always homemade & fresh! We offer Coca-Cola Products & Fresh Brewed Tea. We also have a full-service bar!